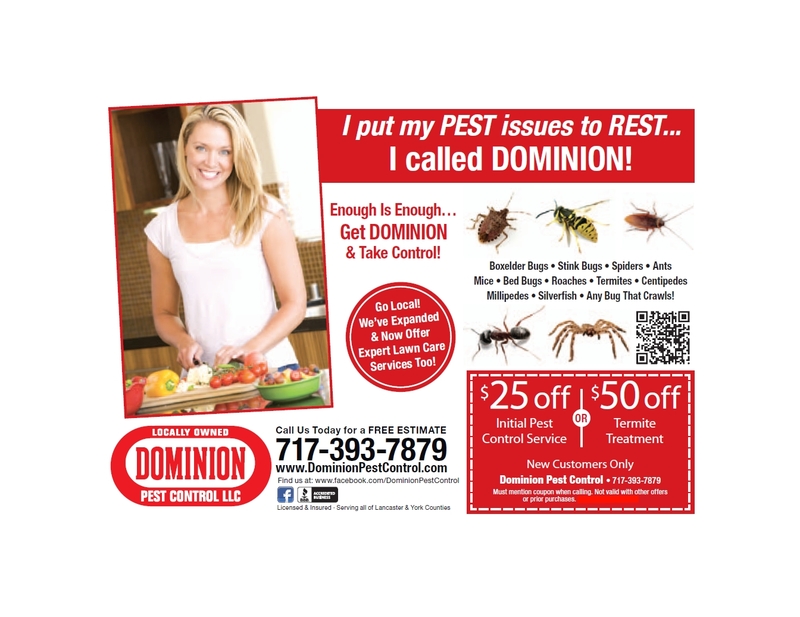 Residents of Lancaster & York Counties are receiving Clipper Magazine’s Pest Control Coupon offered by Dominion Pest Control. To take advantage of the savings, simply click on the picture (left) and print it out. The coupon gives all residents of Dominion’s servicing area $25 off their initial pest treatment or $50 off a termite treatment. After printing coupon, call the office at 717-393-7879. New customers only. Schedules are filling up now in Lancaster and York counties so please call right away to make reservations. Some of the common pests that we are getting calls for are stink bugs, bed bugs, termites & ants. Posted in News on January 28, 2015 by admin.